This set of 2 Equipale leather barrel chairs with high backs are handcrafted from tanned pigskin and Mexican cedar strips. 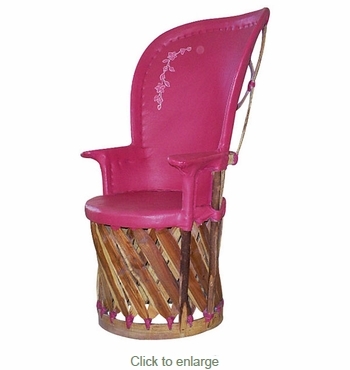 This stylish and durable Equipale furniture will create a southwest or rustic atmosphere in any room of your home. Can be used indoors or on a patio. Since each piece of Equipale furniture is handmade from all natural materials, expect slight variations in color and size. Not available in cowhide.